Dozens of houses on the hot, dusty main road that stretches from Ethiopia into Sudan look as if they have been closed in haste. Guards grimly patrol the border, stopping anyone who looks as if they are trying to cross illegally. The nightclubs and bars are emptier than usual, although they still attract Sudanese who cannot drink alcohol in their own country under sharia law. Metema, with a population of some 100,000 people, is one of a handful of towns across the region that serve as feeders for a booming trade in migrants from Ethiopia, Eritrea, Somalia and Sudan, with many hoping to make their way to Europe. Life has become a cat-and-mouse game: the authorities are cracking down, yet the migrants just keep coming, often risking death. Since 30 Ethiopian Christians who passed through Metema were killed by the Islamic State (Isis) group in Libya a few months ago, the Ethiopian government has become much more vigilant. It claims to have detained 200 smugglers across the country, and police say about 28 of them are from Metema. In Metema, the effect of the crackdown is clear. But while the flow of migrants has dropped from about 250 a day, it’s still strong at 100 to 150, according to Teshome Agmas, the mayor. “It’s just a pity that people choose to endanger their lives in an effort to move out of their country and work in inhumane conditions abroad,” he said. Getachew Merah, a rail-thin 30-year-old aspiring migrant from Ethiopia, has made three unsuccessful attempts to cross into Sudan, and is now trying again. He said his father is dead and his mother lives in extreme poverty in a rural village in the Amhara region. Merah has tried just about every job in Ethiopia. He’s worked as a butcher, a guard, an assistant in a heavy-duty truck, a labourer carrying oil back and forth from between Sudan and Ethiopia and more. But he simply can’t get enough money to change his life or his family’s. He hopes to earn money in Libya to send back to his family, and eventually return to start his own business. Three times before, Sudanese police arrested him and sent him back to Ethiopia. Each time, he didn’t have enough money in his pocket to bribe the police. So this time, he is planning to enter Sudan as a daily labourer on a farm and earn about $150 – enough for bribes – and then disappear into the forest to reach the capital, Khartoum. 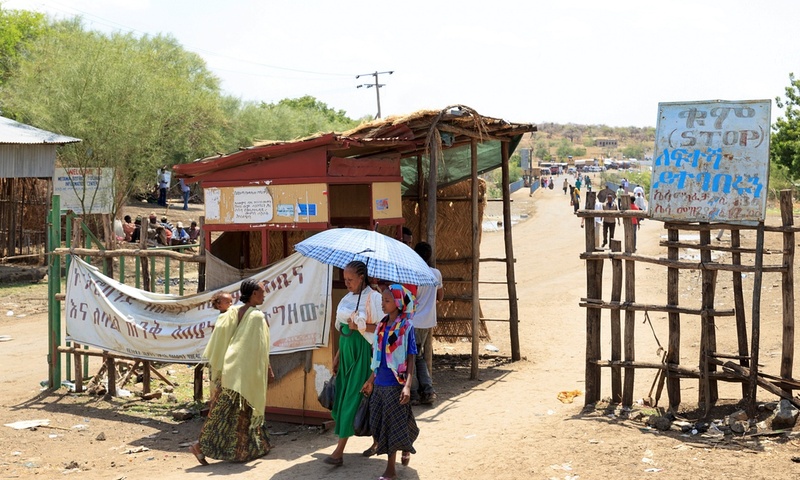 Almost 80% of Metema’s businesses are run by smugglers and their affiliates, according to Sister Hamelmal Melaku of the Ethiopia Higher Clinic. They smuggle charcoal, oil, fruit and, of course, people. With the government sweep-out, migrants are no longer showing up at the clinic, and the temporary shelter built for migrants in the middle of the town sits idle. Like the migrants, the suspected smugglers say they are poor. Adamo Anshebo is under detention in Metema as a suspected kingpin, which he denies. “I came here after selling all my property to receive and take back home my sick child, who was working in Sudan,” he said. There is no way to tell if it is the truth. Poverty in Ethiopia fell significantly from 44% in 2000 to 30% more than a decade later, according to the World Bank. However, the country remains one of the world’s poorest and is ruled by an authoritarian government. More than 96% of people in the country’s rural areas are still barely eking out a living, according to Oxford University’s poverty index. Ethiopia is also a transit point for most Eritreans travelling to Europe, according to the UN’s high commissioner for refugees. While exact numbers vary, Eritreans make up one of the largest groups of migrants crossing the Mediterranean, coming second in number only to Syrians. Somalis are third. According to accounts from several migrants and officials, the smugglers operate in and from all parts of Ethiopia. While major smugglers stay in cities like Addis Ababa, the capital, affiliates known as “shaqabas” operate in and around small towns like Metema, Moyale to the south and Afar in the north-east. The migrants say they are not asked for money in Metema, because they could easily be robbed or lose it. Instead, they are charged upon arrival in Khartoum or other Sudanese cities. The final payment is made once they reach the Libyan coast and, in many cases, depart for Europe. The trip to Europe can cost as much as $5,000. Often, the migrants don’t carry all their money for fear of being robbed, so payment is made through their families, via transfer by hand to the smugglers or affiliates in their hometowns. Metema’s government officials said they have repatriated more than 1,100 migrants arrested while trying to cross to Sudan illegally. They come from all parts of Ethiopia, especially the south, as well as Eritrea, the officials said. Ethiopian immigration officials on the Sudan border confirm that some of the migrants are foreigners, and more now from South Sudan because of the conflict there. Other migrants tell similar stories of poverty. Two women in their 20s travelling together, who refused to give their names out of fear of their safety, said their only reason for migration is economic. They, too, said they wanted to work abroad, then return home to help their families and start a business. Both have not worked in Ethiopia since completing high school.